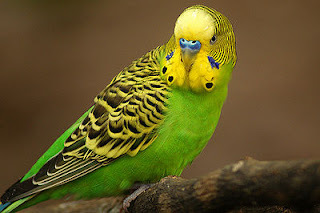 Budgerigars (Melopsittacus undulatus) are better known as common pet parakeets. They are small, long-tailed, seed-eating parrots and are indigenous in the drier parts of Australia. Screening of metazoan genome data identified multiple endogenous Hepatitis B viral elements in the budgerigar genome. Phylogenetic and molecular dating analyses show that endogenous Budgerigar Hepatitis B Virus (eBHBV) share an ancestor with extant avian Hepatitis B Viruses and infiltrated the budgerigar genome millions of years ago. It could be calculated that Budgerigar Hepatitis B Virus inserted into the budgerigar genome at least 2.5 to 5.0 million years ago. A short time later another team mined six additional avian genomes. A phylogenetic analysis reveals that the endogenous Hepatitis B viruses are more diverse than their exogenous counterparts and that the endogenous and exogenous Hepatitis B viruses form distinct lineages even when sampled from the same avian order, indicative of multiple genomic integration events. Endogenous viral elements (EVEs) are entire or fragmented viral genomes that have been integrated into the genome of their hosts in a sometimes distant past. They are therefore vertically inherited in a stable manner. These elements can be seen as the genetic ‘fossils’ of which can be detected in whole genome sequence data millions of years later. The genomic organization of both eBHBV1 and eBHBV2 is nearly identical to that of modern-day avian Hepatitis B viruses. I suspect that endogenous Budgerigar Hepatitis B Virus will have much in common with Parrot Hepatitis B Virus as these species are closely related.